$19.47 Winco 901-P1 Juice Dispenser Jar 7-1/2 Qt. $72.62 Winco 902 Stainless Steel Juice Dispenser 7-1/2 Qt. $84.82 Winco 901 Stainless Steel Juice Dispenser with Brass Accents 7-1/ 2 Qt. $135.99 Thunder Group SLRCF0031GH Juice Dispenser 2-1/5 Gal. $442.81 Omcan (FMA) 19480 Triple Juice Dispenser with Silver Base, 24 Qt. 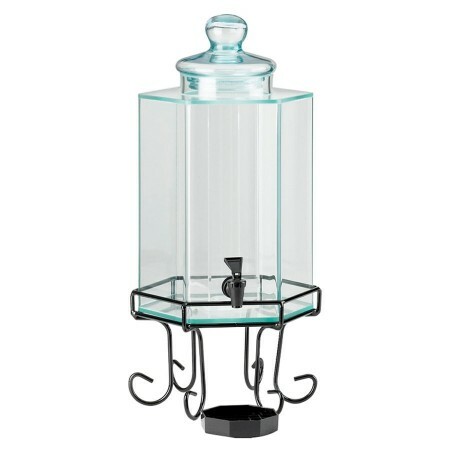 Serve refreshing water, juice, or iced tea in style with the Cal-Mil 1111A Octagon Iron Acrylic Beverage Dispenser 2 Gallon. Boasting an octagon-shaped, crystal-clear acrylic tank, this exceptionally durable dispenser provides maximum product visibility showcasing the vibrant colors of chilled drinks. Perfect for self-serve buffets and catered events, this premium quality dispenser has an easy-to-use spigot while its black iron base elevates it above tabletops for easy access. For a mess-free service, this BPA-free beverage dispenser includes a drip tray while its highly durable glass lid keeps contents fresh for a long period.